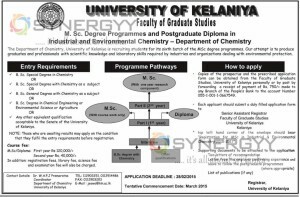 Faculty of Graduate Studies of University of Kelaniya invites applications for its sixth batch of the M Sc degree programmes. This programme is to produce graduates and professionals with scientific knowledge and laboratory skills required by industries and organizations dealing with environmental protection. Any other equivalent qualification acceptable to the Senate of the University of Kelaniya. NOTE: Those who are awaiting results may apply on the condition that they fulfil the entry requirements before registration. Copies of the prospectus and the prescribed application form can be obtained from the Faculty of Graduate Studies, University of Kelaniya personally or by post by forwarding a receipt of payment of Rs. 750/= made to any Branch of the People’s Bank to the account Number 055-1-001-1-0667549. Each applicant should submit a duly filled application form to “Senior Assistant Registrar, Faculty of Graduate Studies, University of Kelaniya, Kelaniya. In addition: registration fees, library fee, science fee and examination fee will also be charged.